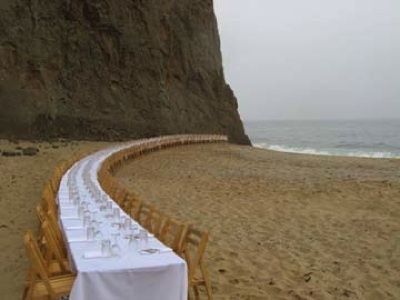 Santa Cruz artist and foodie Jim Denevan sets up a long table in an outdoor environment and hosts a dinner party. 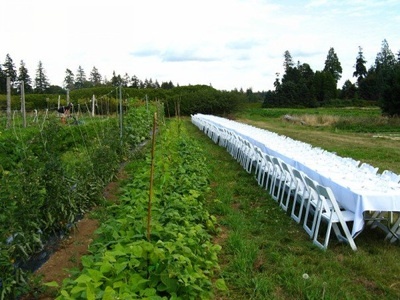 Usually the long table is set in the fields of the farm where much of the food being served has been grown. The intent of the gathering is to reinforce the connection between food and place. There is also an element of conceptual art; the stretched table often mirroring Denevan’s beach art. His organization Outstanding in the Field hosts about two dozen of these dinners per year. More photos on his Flickr stream.